The Firexpress trolley unit is designed for fast deployment in areas when it can be driven through narrow spaces in industrial areas such as factories, warehouses, car decks and engine rooms on ships, aircraft hangars etc. very versatile and can be used in many different set-ups. The trolley unit has in its frame a built-in handle, and two large 12" solid wheels in the back and two rotating castor wheels in the front. This makes either pushing the unit forward or tilting and dragging backwards easy. 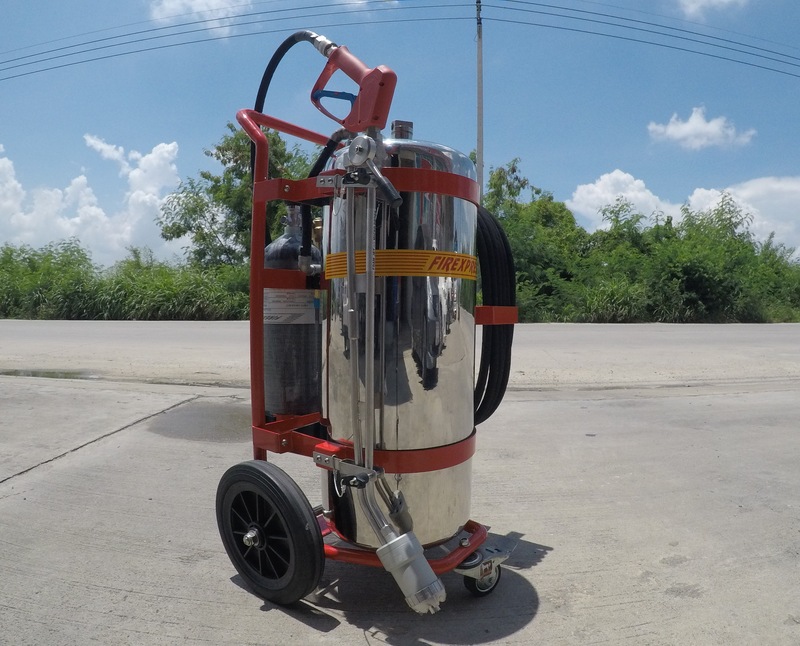 The trolley unit is a self-contained system with a 50 litre tank for premixed water and foam. The system is driven by compressed air delivered from a standard 6.0 litre steel air tank filled to 300 bar. The pressure of the air is reduced to 20 bar before it enters the water tank. The air forces the water into a 10 metre hose, which is connected to the Firexpress lance. As the water entering the tube inside the water tank originates from the bottom of the water tank, only water is supplied to the discharge hose. No air will be forced into the hose as long as there is water in the tank. The system delivers a flow of 22 litres of micro-drops per minute or 110 litres of aspirated foam per minute at a range of 11 metres. A filling kit ensures proper mixing of water and foam and helps avoid having foam spill over the unit. The trolley unit ready for deployment at a moment's notice.